You Scream, I Scream, We All Scream for Sweet Potato Burritos! I remember when I first ran across this recipe for Black Bean Sweet Potato Burritos in the Moosewood Restaurant Favorites Cookbook–I thought the sweetness from the sweet potatoes would be an odd pairing with cumin, coriander, and cilantro, and the texture would be a little too mushy for my liking. They were pretty darn great, actually, and the next time I made them, I “beefed” them up with some crunchy veggies and brown rice. 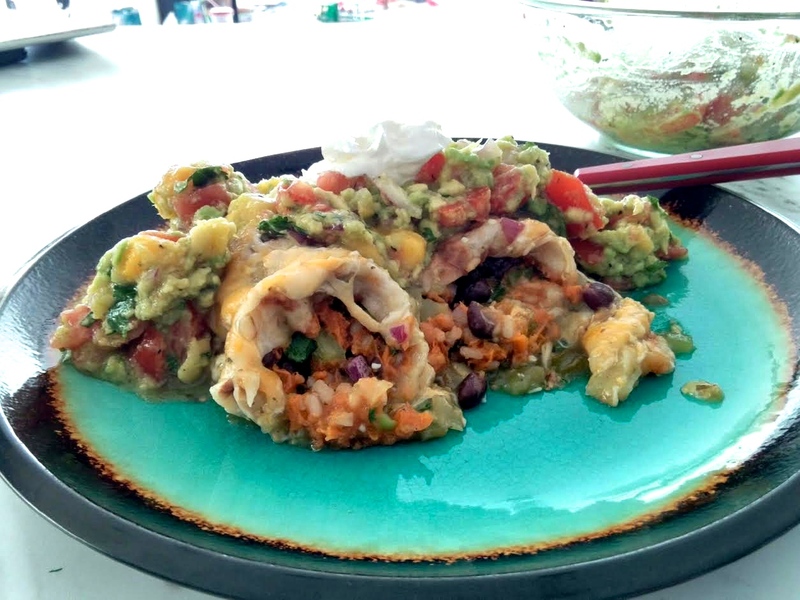 And, of course, I had to turn them into souped up enchilada-style burritos and top them with mango guacamole because I can never get enough fresh lime-tomato-avocado-cilantro goodness. I know this photo isn’t the best, but it sure tasted great! Preheat the oven to 400. Mix the ingredients through salt and pepper in a large bowl. 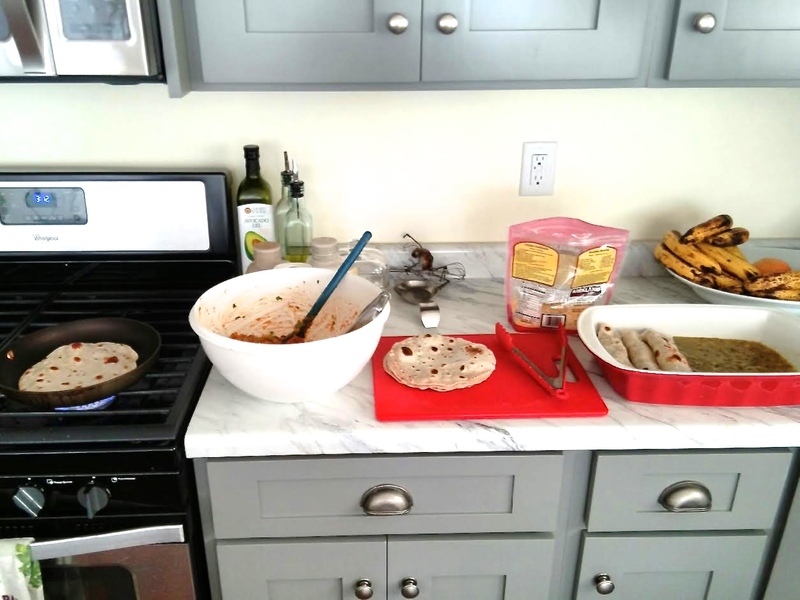 If you are using uncooked flour tortillas, heat up a good stack for filling. Corn tortillas are much more pliable when heated, so you can prepare them in a warm pan with oil, too. Flour tortillas will heat up great without any oil, but pour a tablespoon or so of oil in the pan between corn tortillas. Spray a deep 9×13 baking dish with non-stick spray and spread 2 cups of green chile or tomatillo sauce on the bottom of the pan. I use my favorite #40 cookie scooper for even filling distribution: scoop 3 scoops in the flour tortilla, side by side, and if you’re feeling cheesy that night, put a sprinkling of cheese before wrapping and placing in the baking dish. Continue until your dish is full, usually about 12-15 burritos. If you can squeeze more burritos in for the party, go for it. If you’d rather give your burritos some toe room, have two pans (and more sauce) ready to go. It’s your kitchen, no one’s gonna get offended how you want to do things! Once the pans are full, pour 2 more cups of sauce over the top of the burritos and sprinkle more cheese over the burritos (optional). Bake, uncovered, until the edges are crispy and golden, about 20 minutes. Serving Suggestions: Top with a dollop of sour cream or plain non-fat yogurt, scoop of Mango Guacamole, fresh chopped cilantro; serve with a side of fresh mixed green salad and sliced tomatoes with squeezed lime on top.